A piece of personal geek history: yesterday I had heard that a system I worked on when just out of uni in 1993 just finally got decommissioned. Myself and my mate Brian got out of uni at the end of ’92, and looked for IT jobs. In early 1993 I landed a contract at a Big Company and Brian came on board too, and we wrote the first version of system “X”, using Visual Basic 2 (the application running on Windows 3.1), and a database backend using Netware SQL (virtually unheard-of now). The software was primarily used in a centre in Burwood, by several hundred users, many of whom had never used Windows and a mouse before. Being a small team, we were able to be very responsive to user feedback, and as well as being more productive, hopefully our user base enjoyed using the software, despite our garish screen designs. It was an awesome sight walking around the centre watching hundreds of people using the screens I’d designed. I do recall one funny moment one day when the power went out momentarily. Hundreds of PCs all rebooted at once, accompanied by a collective “ooooooh” from everyone in the place. 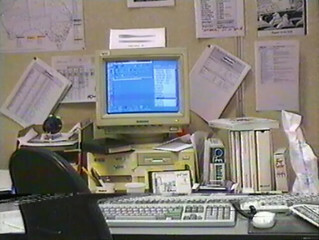 Later in 1993, or possibly the next year, the team was expanded and system got a re-write, which we unimaginatively called “X2”. The re-write used Visual Basic 3 (still on Windows 3.1) with an Oracle database backend. We had some fun naming the Oracle server after computers from Red Dwarf — the main server was Holly, the dev server was Kryten, and the test/staging server was Hudzen. I left the project towards the end of 1994. Brian left a little while afterwards. His experiences inspired an awfully funny superhero sproof called “ContractOr”, which exaggerated the different worlds of contractors and permanent staff for comic value. Alas most of it has been lost in the mists of time. Contractors are dangerous, mercenary, rogue coders who don’t take orders, make up their own rules and cause havoc for the fun of it. In addition they’ll happily switch to another job, regardless of the consequences, if they get a better offer. Oh, and obviously, they are vastly overpaid. A permanent employee is a lazy, unimaginative, shiftless, paperwork-following WIMP. They are only concerned with covering their arse and care nothing for improving work practices – only for making sure they don’t get blamed when things fail to happen YET AGAIN. Brian went on to be one of the first employees of Sausage Software, who released the first major web page designer. I did ask around about 10 years ago and was surprised that system “X” was still running. It sounded like it had undergone a re-write into Delphi, so I doubt by the end that there was any of our original code left. Perhaps only the name was still remaining from what we worked on. But it was still called “X2”. Only this week did it apparently get decomissioned. Given how fast technology moves, I’m still surprised the system lasted 18 years. A few weeks ago I did brain surgery on my computer. My PC (named “Tintin”) finally got a CPU upgrade — which I needed to move off Windows XP onto Windows 7. It’s quite incredible how much dust was inside it. Just obtaining the faster CPU wasn’t straightforward, as sometime in the last couple of months, between the time I thought about it and when I went shopping, they stopped making what I needed (a chip to fit an AM2 socket, and which was compatible with my motherboard, eg to avoid expensive, time-consuming and messy mucking about upgrading a lot more of the computer), and they rapidly vanished from the shops. I ended up buying it on eBay — for the geeks (and my future reference) it was an Athlon 64 X2 4400, which set me back $33 plus $7.50 postage. By no means the fastest CPU supported, but I was also aiming for something with a similar power consumption, so it wouldn’t be hot/noisy (from the fan/s). Not to mention that when the full range isn’t available anymore, beggars can’t be choosers. But still about twice as fast as the old one — well, a similar speed but in two cores. Fine for standard desktop use; the other computer (“Haddock”) does multimedia and games. And on the bright side, it was cheaper than anything bought new. As it happens, I’ve never replaced a CPU in a computer before, and was a bit nervous about it. Oh sure, I’ve mucked about with RAM, and video cards, and hard drives, all that kind of stuff. But there’s possibly nothing as delicate as a CPU’s pins, and I didn’t want to screw it up. I took a look at a couple of books from the library, one on upgrading PCs, and another on building them. (Yes, for once the selection of computer books in a public library wasn’t hopelessly out of date.) The latter had some very handy full-colour photos of the process of inserting a CPU, as well as details of how to apply the thermal paste. Thermal what? CPUs generate a lot of heat. 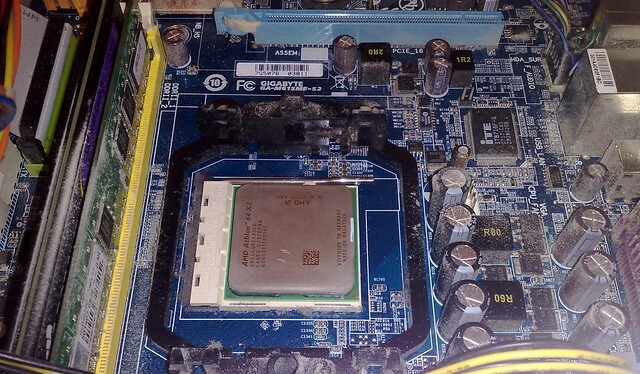 The heat has to make its way away from the CPU, and to do this, you put thermal paste between the CPU and the heat sink, which is what carries the heat away (often via a fan, and out of the computer case). It’s cheap, but you have to go to a specialised computer store to buy it. I didn’t have any thermal paste, and was going to go and buy some when I realised while poking around inside the computer there was a fair bit on the existing CPU. Could I just wipe it off there, onto the new one? I thought I’d give it a go and see what happened. After carefully putting the new CPU in, I used a CPU temperature checker to make sure the paste and the fan was working okay. 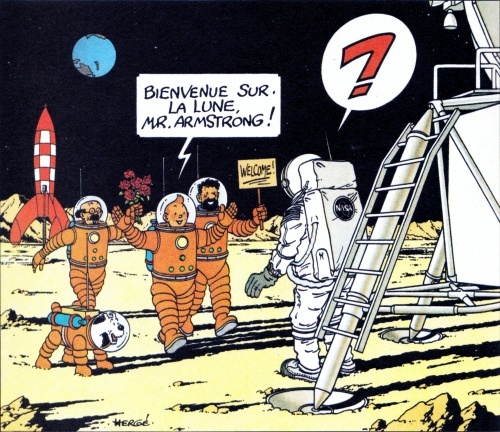 To my surprise it all seems to have worked, and Tintin is now about twice as fast as before. I like it when technology works as planned.